I got my first dartboard when I was in high school. It was among the few possessions I took to college with me and it has traveled with me ever since. The first place of my own was a townhouse that had brick walls separating units. Not wanting to ruin my dart tips I created a monstrous foam backer with the cheapest materials I could find. It was 3 ft x 7 ft closed cell foam on top of 1/2 inch fir plywood all covered in a bright blue burlap. It did a spectacular job of protecting my darts; but according to people with taste, it looked hideous. This blue backstop moved with me when I bought my house and served admirably for a number of years. 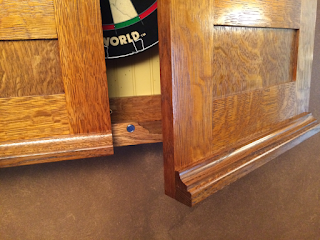 When my wife and I decided to redecorate the room housing the dartboard we choose to put in Kempas hardwood flooring, a faux finish on the walls that looks like leather and nice base molding and crown molding. A giant bright blue burlap covered foam board wasn't going to fit in so I promised my wife I'd make her a dartboard cabinet to limit the damage to the walls. Now, five years later, I've finally gotten around to the project and delivered a Mission-style dart board cabinet in quarter sawn white oak. I built it pretty much verbatim from the plans in the August issue of Woodsmith magazine. So, how did my version come out? Overall I would say that it came out okay. The doors are simple frame and panel construction with solid wood panels instead of the plywood panels specified in the plans. I used solid wood panels because the quarter sawn white oak plywood at my local lumber supplier was not very attractive and had very little flecking. I have done a fair bit of resawing so I was pretty comfortable making these panels from hardwood. The rails and stiles are connected with groove and stub tenons so they went together quickly and were mostly self-squaring. The doors have a few pieces of additional trim to spruce them up a bit. The top has a relatively simple piece of cove molding with a 3/8" bead detail an inch or so below it. The bottom of the door has a sill with a 1/2" diameter cove molding. The author used purchased cove crown molding; however, since I had been wanting to try making my own for awhile I decided to give it a try. I used the project drawings to determine that the cove was about 3/8" deep and about 1 7/8" wide. With these dimensions I was able to layout and make my own molding using my table saw. I could go into more detail of the technique but Wood Magazine has an excellent how-to explanation of this process. Unfortunately my router bit collection does not contain a 3/8" bead bit or a 3/16" round over bit (I know, shocking right?). So, I made the bead profile with a low angle block plane. I planed a white oak board down to 3/8" thick then clamped the board on edge to my work table using a hand screw and a quick clamp. I drew the 3/8" bead profile on the end then a few dozen passes with a hand plane formed the bead. I smoothed it out with some 80 grit sand paper. The cove molding along the bottom of the door was made using my router table and a 1/2" radius cove bit. I needed five feet of this style of molding because it is also used on the chalk trays inside the cabinet. I created the cove on both sides of a wider board and then cut them free on my table saw. The sill detail at the bottom of the door has a slight round over which I made using a hand plane rather than setting up my router. I didn't do a great job of sanding on the doors and as a result I rounded over the corners a little bit. It wasn't too obvious until I added the long flat trim to the doors. Fortunately some clamps and glue helped hide most of the flaws. 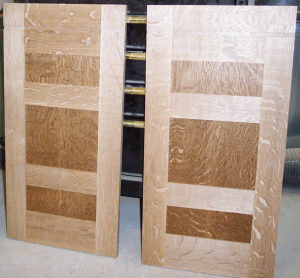 When creating frame and panel doors the panels need to be stained before being installed in the doors. This prevents an unfinished edge from showing when the panels shrink or shift. Here's a picture of what they looked like in the intermediate stage. The cabinet was put together using a tongue and dado in the corners. The back is 3/8" pine bead board plywood. 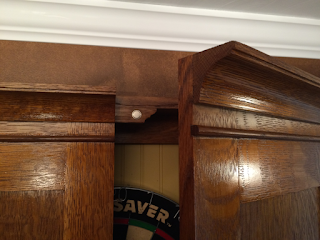 The top and bottom rail in the cabinet are held in place with a bit of glue and pocket screws. The corner brackets were cut on my band saw and sanded to shape using a spindle sander and a block sander shaped to the same curve as the inside of the bracket. I made five and picket the best four to install. This project reminded me again why I hate projects with doors. Despite all the tips and tricks I have read to mount doors it is always a painful chore. I made it a bit more difficult on myself by forgetting to fit the doors before finishing.The doors ended up just a hair too wide so when I mounted them on the cabinet I needed to mount them a little wider in order to get an attractive reveal between the doors. I purchased the no-mortise hinges and door clasp from Horton Brass as did the author. I thought the quality of the hinges was quite good and especially liked that they came with steel screws for test fitting and extra brass screws for final assembly. It is almost like they knew I would strip a couple of the screws in the hard oak. The door clasp came with slotted screw which I must admit look better than Philips head screws but I do not like installing them as they are harder to not strip or slip off and damage something with the screw driver. I purchased the rare-earth magnets, cups and washers at my local Woodcraft store. They work quite well... almost too well and I am considering removing two of them to make the doors easier to open. The dartboard is not the one I got when I was a kid but one my wife and I purchased to replace it. My childhood dart board had round wires between the numbers which caused a significant number of darts to bounce back at the thrower. This new dart board has triangle shaped wires which will hopefully cause fewer bounce backs. Installing the dart board was as simple as putting a U-shaped bracket on the back and adding some spacer blocks to make the dart board not wobble. I finished the cabinet with Walnut Watco Danish Oil and after the oil cured I sealed it with Bulls Eye Amber Shellac. This is similar to how I finished my Craftsman-style nightstand; however, I used an oil based wiping polyurethane on the night stand. 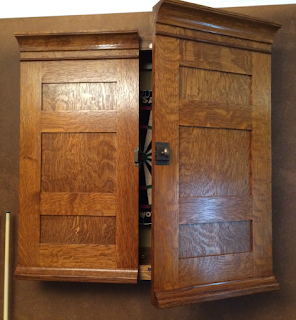 I choose the shellac finish for this project for its quick drying and recoating properties. I painted the back with General Finishes Somerset Gold milk paint. This was my first attempt at using Shellac and my first impressions are not good. The speed at which it dries is great for finishing quickly but in contrast the slowness of polyurethane gives you the ability to push it around fixing mistakes and making sure you've got even coverage. The Shallac dried so quickly that I had trouble getting even coverage without drips. I really like the look of Shellac but I think I need some more practice before using it on a large project again. Since the cabinet was heavy I did get help mounting the cabinet on the wall; however, to make things easy on the two of us I built a brace that held the cabinet the correct height above the floor. The brace was made out of 2x4 pine and held the cabinet the correct height above the floor. This was a fun project to build. 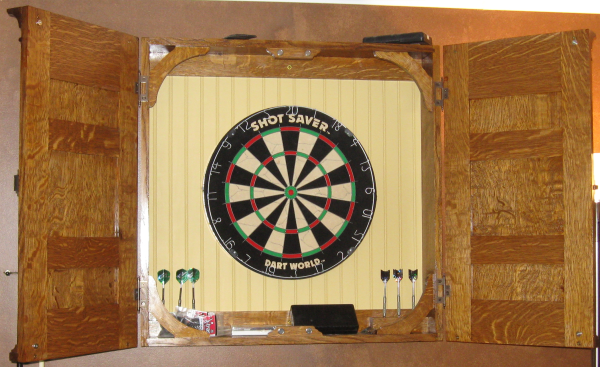 There were no significant errors or gaps in the plans and the final result is a very attractive wall mounted dartboard cabinet. I tried a couple of new construction and finishing techniques some of which worked (making my own cove molding) and some didn't (Shellac). There were a couple of things which came out less than perfect that I am attributing to being rusty and rushing.